Prime Minister Narendra Modi on Thursday visited the famed Shwegadon Pagoda, the grave of last Mughal emperor Bahadur Shah Zafar here and also prayed at a Kali temple on the third and last day of his visit to Myanmar, before leaving for home. “After fruitful and constructive bilateral engagements in Myanmar, PM @narendramodi departs for Delhi,” External Affairs Ministry spokesperson Raveesh Kumar tweeted. Modi planted a sapling at the Shwegadon Pagoda, the most sacred of the Buddhist pagodas in Myanmar and which contains strands of hair from the head of Buddha. The Prime Minister then paid tributes at the Martyrs’ Mausoleum dedicated to Aung San, father of Nobel Peace Laureate and Myanmar State Counsellor Aung San Suu Kyi, and other leaders of the pre-independence interim government of Myanmar who were assassinated in July 1947. In a special gesture, Suu Kyi, who came down to Yangon from Nay Pyi Taw, showed Modi around the Bogoyoke Aung San Museum, the last residence of Aung San. It was here that Suu Kyi grew up as a child. The Prime Minister then offered prayers at the Shri Kali Temple that was built by Tamil migrants in 1871 when Burma province was a part of British India. “Performed Puja at Yangon’s Kalibari Temple. 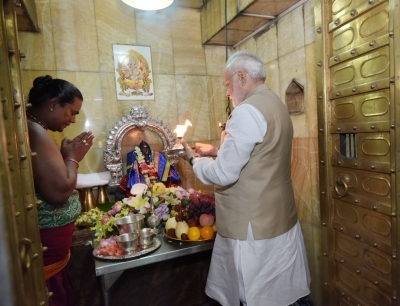 Feeling extremely blessed,” the Prime Minister tweeted, with photographs tagged of the temple. In his final engagement prior to his departure, Modi paid floral tributes at the grave of the last Mughal emperor Bahadur Shah Zafar. On Wednesday, Modi held bilateral discussion with Suu Kyi in Nay Pyi Taw following which India and Myanmar signed 11 agreements. Modi said India shared Myanmar’s concerns over the violence in Rakhine state that has claimed the lives of Myanmarese security personnel and innocent people and has triggered a mass exodus of the minority Rohingya Muslims. Later on Wednesday, he went to the ancient city of Bagan and visited the Ananda Temple, where the Archaeological Society of India is involved in restoration. In the evening, he addressed the Indian diaspora at Thuwunna Stadium here.